‘Dhadak’ star Janhvi Kapoor, on the third day of the ongoing Lakme Fashion Week (LFW), made her showstopper debut as she strutted the runway in an elegant floral lehenga. The 21-year-old, who donned designer Nachiket Barve’s ‘Millenial Maharanis’ collection, revealed she was worried about tripping on the ramp. Apart from the ‘Takht’ star, other celebs who turned showstoppers on Day 3 of LFW include Karisma Kapoor, Shahid Kapoor, and Disha Patani. 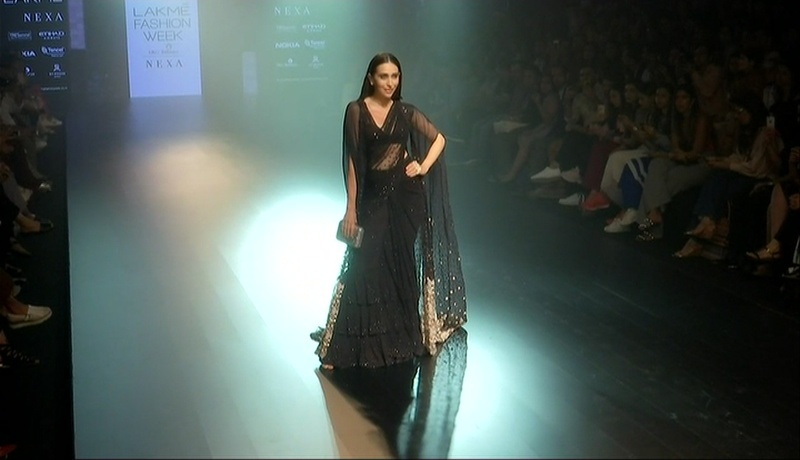 Donning a black glittering sari, Karisma turned muse for designer Arpita Mehta.